Tewksbury Bartending School - Only 20 miles Northwest of Boston - Free Parking! Only 20 Minutes North of Boston! Read What Harvard College Says About Us! Have you ever looked around a nice bar, curiously envying the happy bartenders having a great time while raking in gobs of money? Did you wonder how they learned the skills necessary to pour drinks so quickly, remember all those recipes, and keep their cool all at the same time? How did they get there? Could I learn to do that? Bartending in New Engalnd can be a tough world to break into. Corner bars with on-the-job training are few and far between. Customers are more educated and sophisticated than ever before. They come from all over the world, they know about wine, they enjoy the scene and they have become more demanding. 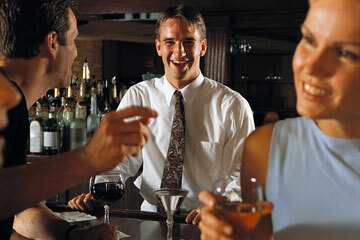 New England customers are looking for a bartender who is as knowledgeable, as personable, and as demanding as they are. In this more professional bartending environment-if you’re not fast, organized, and efficient you surely won’t last very long in an upscale bar. Not surprisingly, 7 out of 10 bartenders will attend a professional bartending school to facilitate their entry into this lucrative profession. Without the professional bartending training that is all but required by popular bars, clubs and restaurants these days, you won’t stand a chance of beating out those that have it. Professional Bartending Schools of America has created bartending programs to answer the demand for professionally trained bartenders. We provide the bartending education, the speed, the organizational skills as well as customer service and alcohol awareness at our bartending school. Then we will follow up your training with our personalized job placement assistance program that is available to all of our Boston-area graduates. We are very proud of our Tewksbury bartending school campus. We invite you to personally visit our bartending school so you can see with your own eyes the quality of our facility and the professionalism of our staff! Our Tewksbury campus has been training Boston-area and New Hampshire bartenders from our same location (under the same ownership) since 1989. Our school is conveniently located on Main Street in Tewksbury. See our Map and Directions here. Take the time to check out all of our pages and then TAKE THE NEXT STEP! Request more information on our Tewksbury, Massachusetts bartending school or call us today and we will show you how we can help you get started in your new bartending career in the greater Boston area. Unlike many of our competitors, your personal check is welcome here!